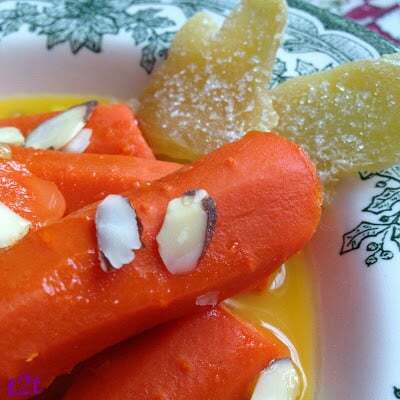 A wonderful and healthy way to eat your carrots. 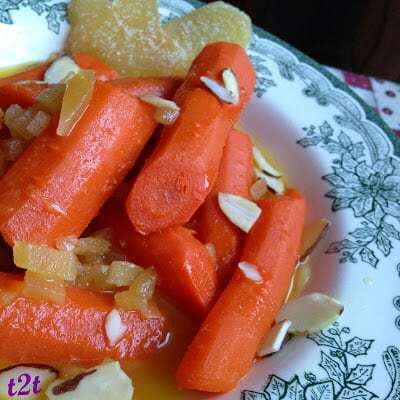 The sauce is made with orange juice, honey, sliced almonds and crystallized ginger. 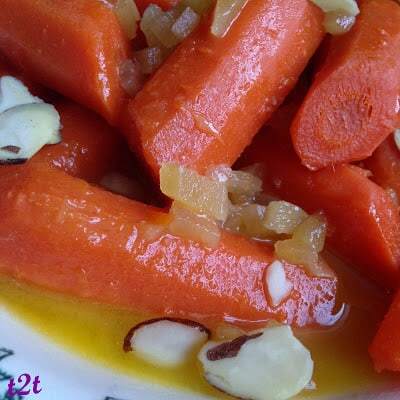 Gingered carrots are the perfect side to any meal. Grilled chicken, pork tenderloin or steak would certainly benefit with a side of gingered carrots. Candied fruit or flowers that have been boiled or dipped in a sugar syrup, then dipped into granulated sugar and dried. Candied fruits, also called glacé fruits, are generally used in cakes, breads, and other sweets. Candied flowers are generally reserved for decorating desserts; candied fruits can also be used in this manner. The most common fruits that are candied are cherries, pineapple and citrus rinds. Angelica and Ginger are also candied favorites. Among the crystallized flowers, violets and miniature rosebuds and rose petals are the most common. Candied fruit and flowers can be stored airtight in a cool, dry place. Glacé [glah-SAY] is French for “glazed” or “frozen,” such as MARRONS Glacés (candied chestnuts). It can also refer to the frosting on a cake or frozen desserts. Glace [GLAHS] 1. French for “Ice Cream” 2. The word glace is also used in reference to a reduced stock, as in GLACE DE VIANDE. Glace de viande [glahs duh vee-AHND] French for “meat glaze,” glace de viande is made by boiling meat juices until they are reduced to a thick syrup. It’s used to add flavor and color to sauces. 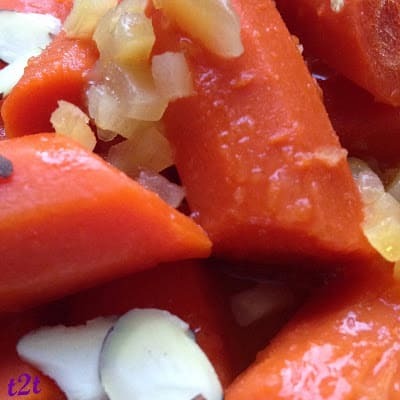 Cook carrots in a medium saucepan in boiling water, for 10 minutes or until carrots are fork tender. 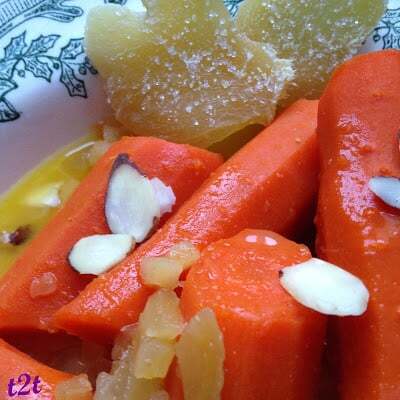 Drain water and remove carrots to serving dish, set aside. Melt butter in saucepan over medium-low heat. Whisk in honey, salt, ground ginger, crystallized ginger and cornstarch. Gradually whisk in orange juice. Bring to a boil over medium heat, whisking constantly for 1 minute. Remove from heat. Add sliced cooked carrots, toss to coat. 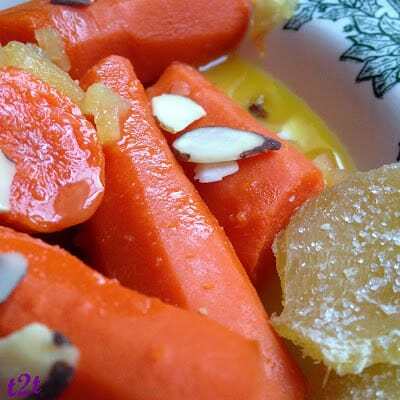 Garnish with sliced almonds.